There are lots of different fish that live in the River Medway and different fish like different parts of the river. From its source in High Weld in Sussex, the freshwater river flows through Kent and down to the coast by the Isle of Grain, where it meets the salty waters of the sea. This area where the river meets the sea is called the estuary. The estuary is salty, but because of all the fresh water flowing in from the river it is not as salty as the sea. This makes it an unusual and special habitat. Some fish live their lives in the freshwater twists and turns of the river, while others like the more salty waters of the estuary. Others move from the sea into the freshwater of the river, and this is known as migration. Our special nursery area is in the estuary, and is an important place for young fish from the sea to grow big and strong before they venture out into the oceans. In many languages, bass are known as ‘wolves of the sea’ because they are such skilled predators. 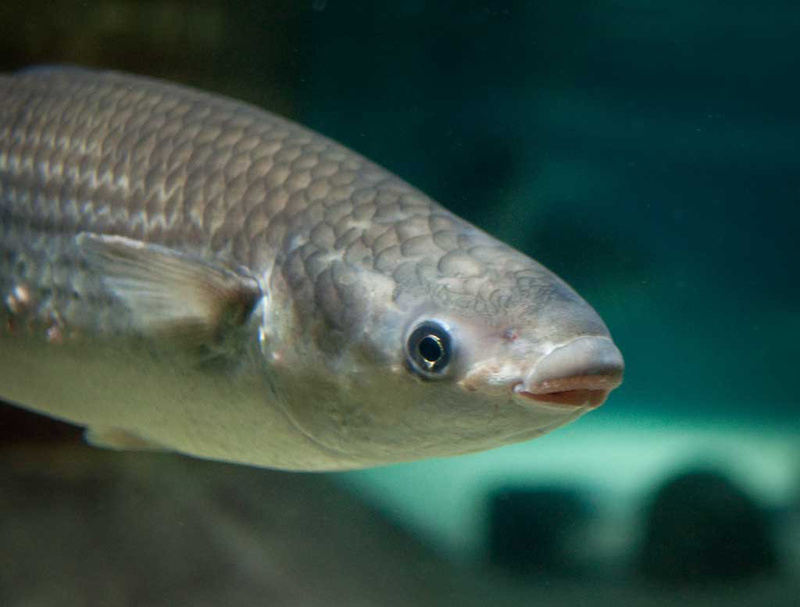 Silvery scales give bass a distinctive blue-grey shine, and the large fins along their backs have sharp spines. Adult bass live in the sea, and the eggs they lay drift into bays and estuaries where they hatch. The young, or juvenile, fish find shelter in the flooded saltmarsh, and feed in the mudflat and saltmarsh. While they’re small bass like to gather together in schools for protection. When they reach 4 or 5 years old, they leave the estuary to live in the open sea. As they grow, they are at less risk of being eaten and so do not gather in schools as much and live a more solitary life. As adults, bass feed in coastal waters throughout the warm months of summer, then move to deeper offshore waters in winter to breed and spawn. Young bass will eat whatever they can find! This means their diet can consist of crabs, shrimps and worms, as well as insects that get washed into the estuary such as flies, spiders and mites. As they become adults and grow larger, they become much better hunters and mostly eat small fish. Herrings are known as the “silver of the sea” due to silver colour of the body and the good price fishermen can get for them. Herring are a small, torpedo-shaped fish with silvery iridescent scales. Their one dorsal fin is easily recognisable due to its square shape. Young herring move with the changing sea temperatures, migrating to coastal waters such as estuaries in the summer when the water is warm, and moving offshore in winter when the coastal waters get too cold. Adults move further offshore into the open ocean and live in the water column. Herring are small and tasty, and so are at high risk of predation, or being eaten, by bigger fish. Because of this they remain in deeper waters during the day, rising to surface waters at night to feed under cover of darkness. To stay safe, herrings also swim in large groups called schools. They can consist of billions of herrings. Herring feed on small shrimps but have the ability to filter feed, where they draw water through their mouth and filter out microscopic organisms known as plankton. 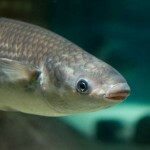 Sole have bristly beards which they use to help them find their prey of crustaceans and worms hiding in muddy sea beds. Dover sole are an oval shaped flat fish. They have a small tail and long, thin fins. Young Dover sole look like normal round fish when they hatch. It’s only after 6 weeks that they change, or metamorphose, into flat fish. The juvenile fish live in nursery areas like the river Medway, where the saltmarsh plants provide protection from predators. Adults tend to live in deeper water offshore but come into shallower water to feed and spawn when the weather warms up in the spring and summer. Sole usually rest during the day and go hunting for food during the night. Swimming on the sea floor, they scour the seabed feeding on worms, prawns and small crabs. Mullet are sometimes call jumping or happy Mullet because they jump out of the water when travelling in large groups to spawning grounds. Scientists think that this is a way to get more oxygen in their bodies. Mullet have torpedo shaped bodies, with short fins and a forked tail. They are covered in large scales which can be dark blue, grey or olive green in colour on their back and silvery white along their sides and belly. Unlike most fish, mullet do not have a lateral line. This is an organ used to detect changes in water currents and looks like a dark straight line along the side of a fish – you won’t see one on a mullet! For most of the year, adult Mullet live close to the shore in coastal waters but will move to deeper water further from land to breed and release their eggs. These eggs hatch within 48 hours! 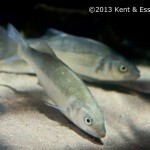 When the juvenile (young fish) Mullet hatch they move back to shallower waters near the shore where they feed and grow. Mullet like to live in muddy or sandy bottomed waters that offer lots of food. Both adult and juvenile Mullet will move further inshore, some even travelling up estuaries and rivers where food is plentiful and there is shelter from predators. It will take a juvenile Mullet between 4-5 years to become an adult, with some Mullets living to up to 16 years old in the wild! Mullet have small heads and a triangular shaped mouth full of very compact teeth. They are bottom feeders which means they eat things on the sea floor. Their shaped mouths and rows of teeth help them eat lots of small aquatic algae, plankton and all sorts of waste material they find floating on the sea bed. Just like we are left or right handed, Flounders are left or right “eyed”! When they hatch, they have two eyes on the top of their head but as they grow and their bodies become flatter one eye will move to either the left or right side. Shaped like a kite, flounders are flat fish and have both their eyes on the top of their body. Most are patchy brown and grey coloured to match the sea floor where they live. They can even change colour so they can hide if they feel threatened by a predator! In the autumn and winter, adult flounders breed and spawn in deeper waters at sea. They release their eggs which hatch into juvenile flounders of only a few millimetres big. Currents and winds will carry the juvenile fish closer to the shore where they will grow and develop in warmer, more sheltered habitats. After around 1-2 years the fully grown young adults will move into deeper waters again, starting the life cycle again. Flounders are flat and camouflaged to blend in with the sea floor. They ambush their prey from under the cover of mud and sand and catch things like small crabs, shrimp, marine worms and other small fish. If you aren’t sure what some of the words in this section mean, click here to find out more about the terms used to describe fish and their body parts.